The Bomber County Gateway Trust has been formed with the object of designing, procuring, constructing and installing an iconic landmark art installation on the county border of Nottinghamshire and Lincolnshire. 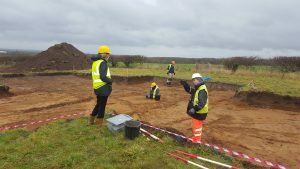 On 19th November 2018 we started to excavate the foundations for the landmark. This involved placing more than 1100 tons of concrete into the base which was itself more than 300m from the nearest road. Jessops Construction Ltd – Project Management, Site Facilities, Principal Contractor (H&S) services and Site Supervision. BSP Consulting – Engineering Designs. Waldeck Consulting – Principle Designer (H&S) and Safety Audits. G. S. Hughes Ltd – Stone for the platforms and standing areas. Midland Reinforced Concrete Ltd – Steel fixing of the reinforcement cages. Flying Hire Events – Mobile Floodlights. R Mason Site Services Ltd – Holding-down bolt alignment and grouting. Acast Industrial Flooring Ltd – Concrete placement, pumping equipment (Camfaud) and temporary Haul Road (Live Trackway). 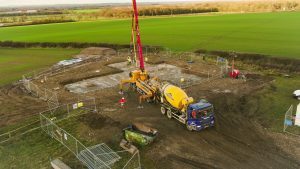 Hi Vis-ion Ltd – Aerial filming. A FANTASTIC TEAM EFFORT BY ALL ! !